It'll be winter in a few days. 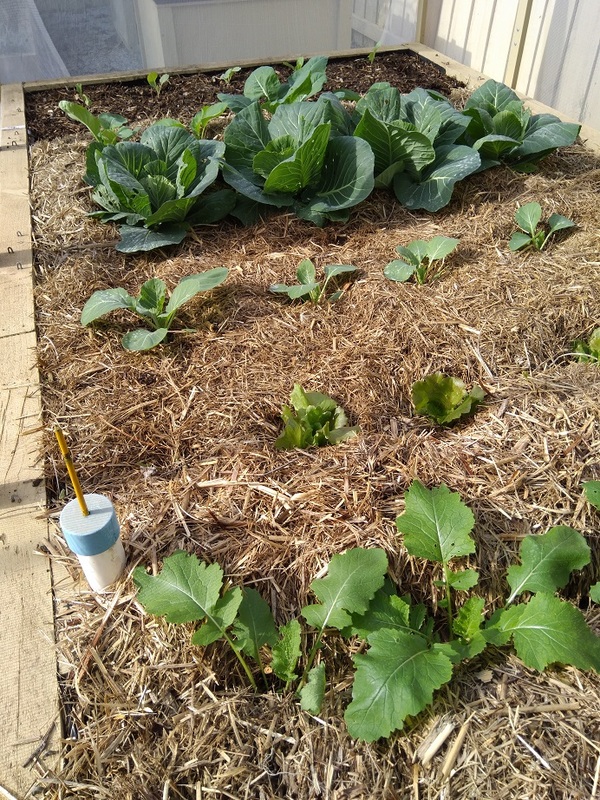 and my Ecobeds are starting to produce winter veggies. 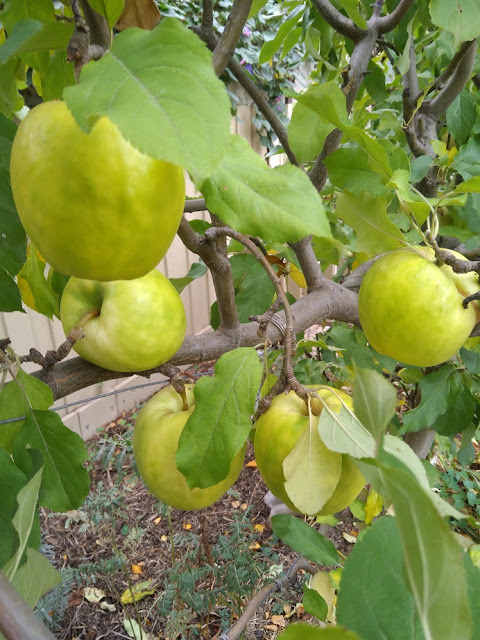 My espaliered apples are ready for harvest, but I will leave them where they are until I need them. One of my Ecobeds is being prepared to grow a crop of potatoes. They wont be planted until early August, but soil preparation began in April by sowing a crop of green manure. 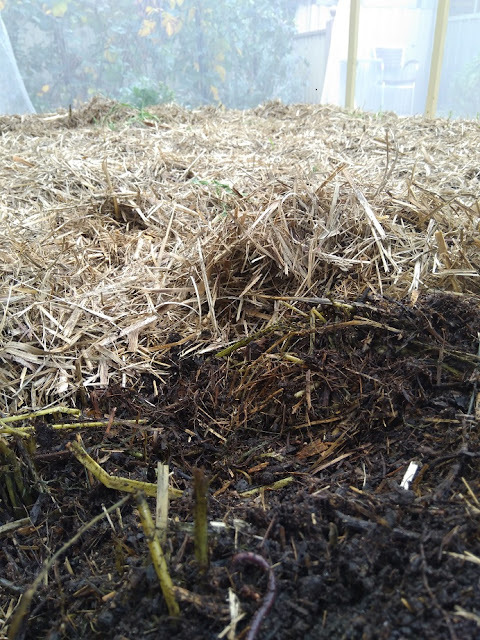 Once the crop started to flower, it was slashed and covered with a thick layer of compost followed by a deep mulch of straw on top. 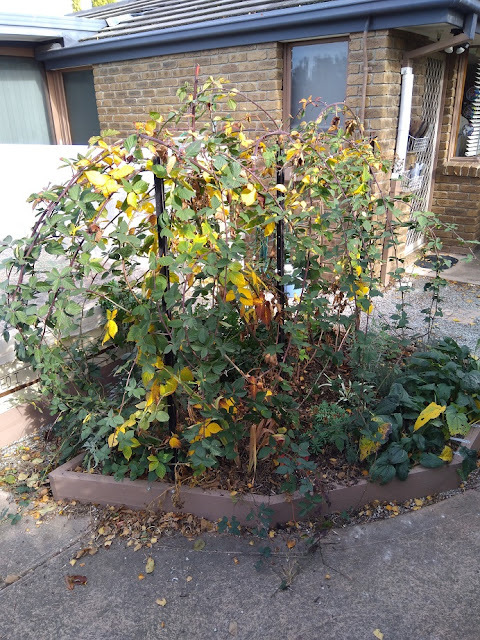 It's all breaking down nicely as you can see in the photo and it will be in great shape for the spuds in a couple of months. My thornless blackberries will be dormant in a few weeks. Spent canes (on which the last crop grew) will then be removed at their base, and second year canes (on which next years crop will grow) will be trained along supporting wires. 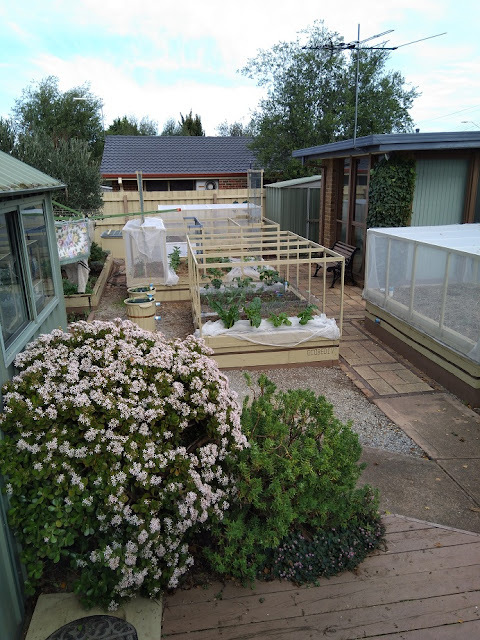 This drip irrigated bed grows herbs, insect attracting flowers and a couple of fruit trees. It has been cleared of old foliage and other organic waste, and a layer of homemade compost is being applied. Finally a thick layer of organic sugar cane straw will be added to keeps the soil microbiology active during winter and rejuvenates the soil for the next growing season. 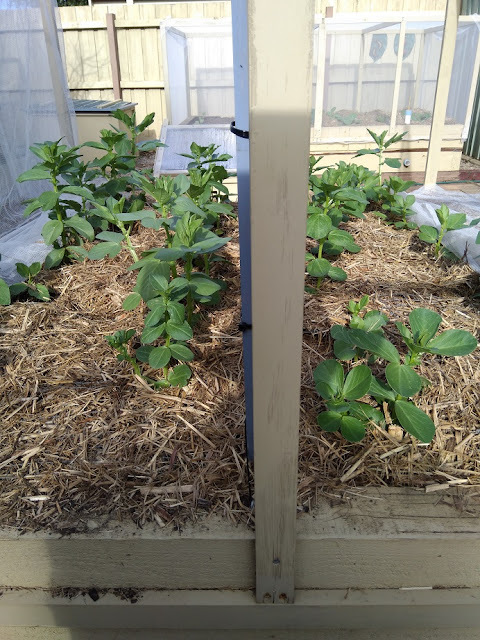 The broad beans have been knocked around a bit by blustery winds recently, but they are healthy and growing strongly. 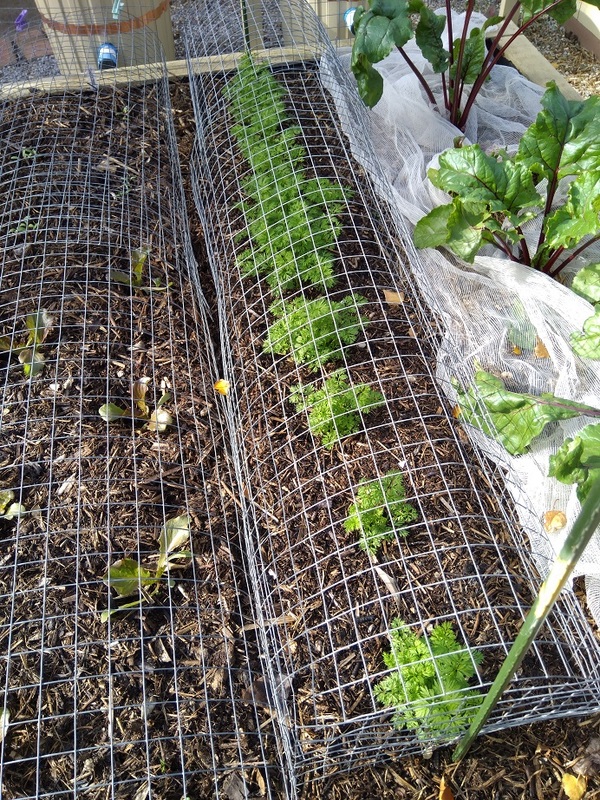 There are 2 plantings of beetroot in this row, sown about a month apart. The later sowing uses Charles Dowding's technique of sowing beetroot seeds in clusters and later transplanted each cluster into a single planting holes in the soil. 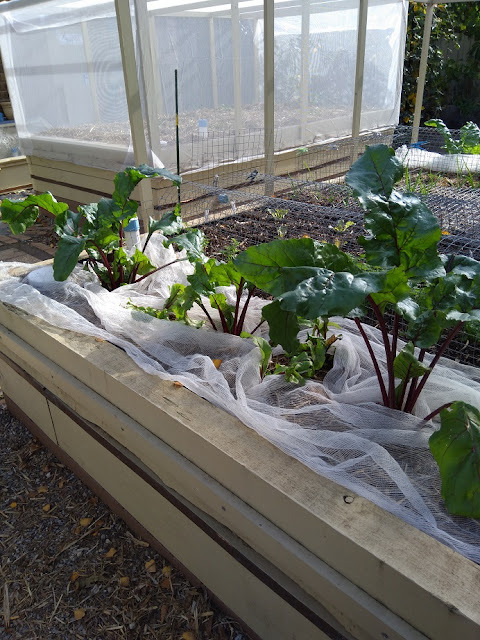 The result is to spread out the harvest of small beetroots and increase overall productivity. These carrots were sown into tray modules and then transplanted in clusters as soon as they were big enough to hold the soil together. I have grown carrots for many years densely in blocks, not thinning them until they are big enough to eat. Gradually the carrot size increases as the bed thins out, but by the time the final harvest takes place, the remaining carrots are full size. 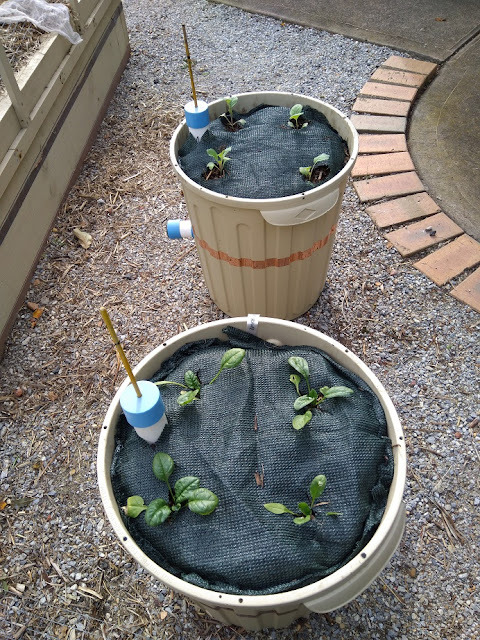 If this trial works out as expected, it makes raising carrot crops in an Ecopropagator practical all year round including winter. 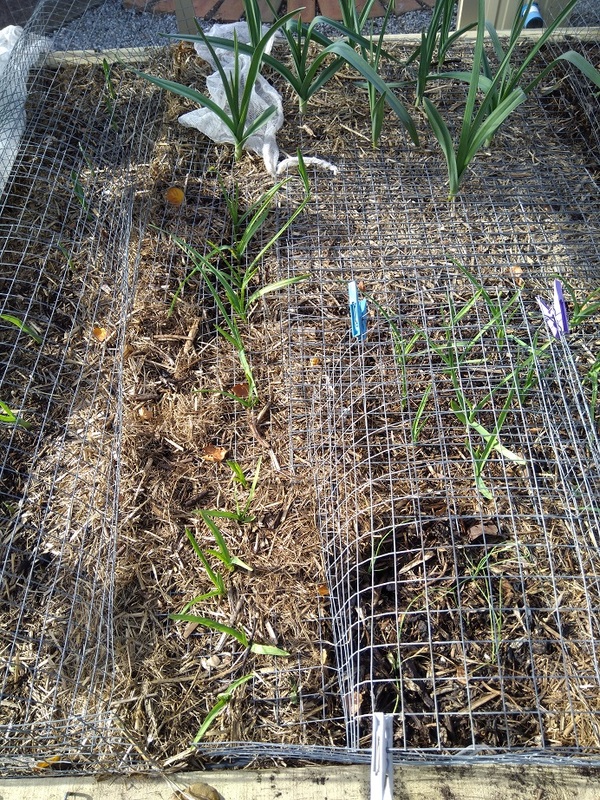 My usual crops of garlick and leeks (in clusters) are up and growing steadily. My brassica bed is fully covered with Vegenet to keep digging Blackbirds and butterflies out. I plan to keep this bed busy all year with monthly sowings of staple green vegetables in the Ecopropagator. I usually grow 2 silverbeet in a 1500mm long row, but this year I plan to grow 4. The idea is to continuously harvest outer leaves to ensure supply over a long period, and keep the plants compact so they don't become too crowded. 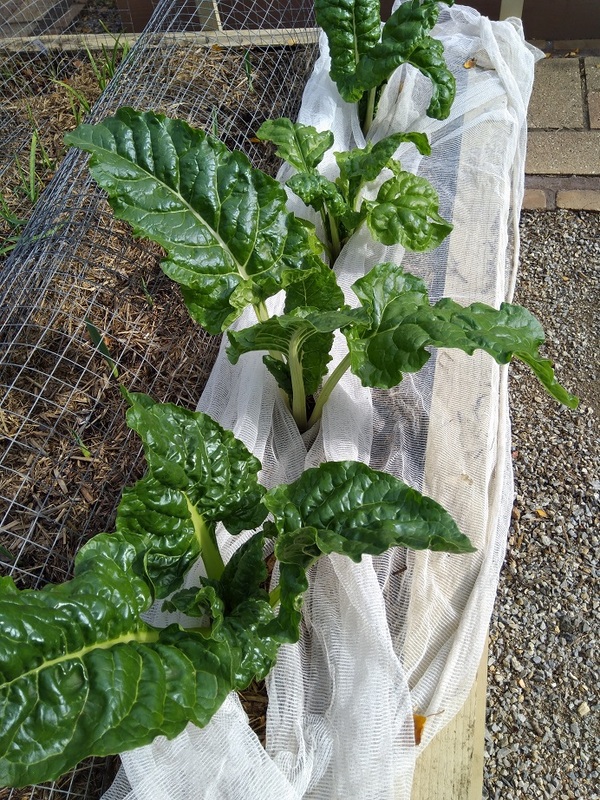 The same technique is used with this English Spinach (closest Ecobin). The Romanesco Broccoli in the other bin will overhang the rim hopefully preventing overcrowding. At this time of year I restore my Ecopropagators with a full pull down, disinfection and repaint. 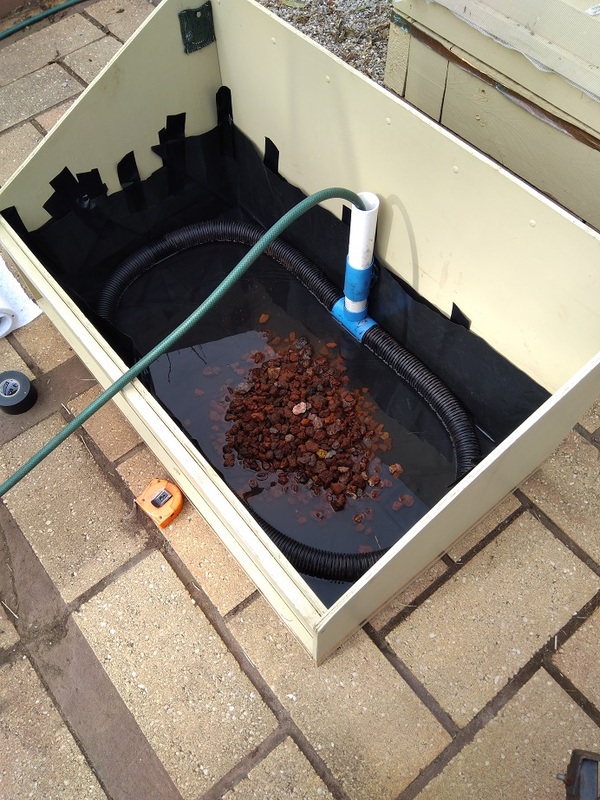 The water tank lining, fleece tank cover, sieved compost wicking media and copper snail barrier are replaced. 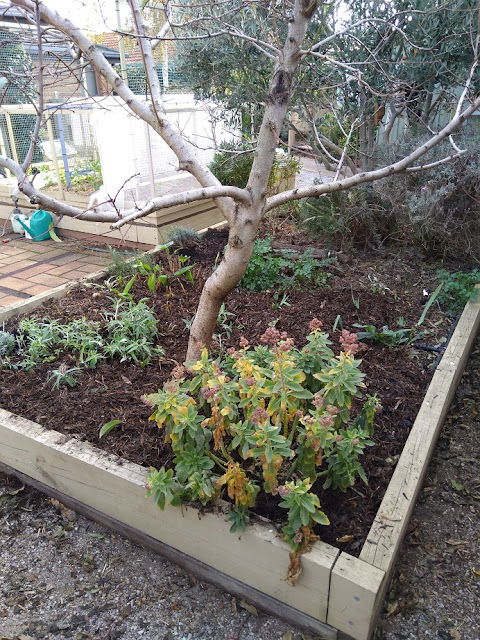 (The sieved compost and fleece are replaced again six months later). I do all this to limit build up of plant pathogens in the unit's constant moist environment. 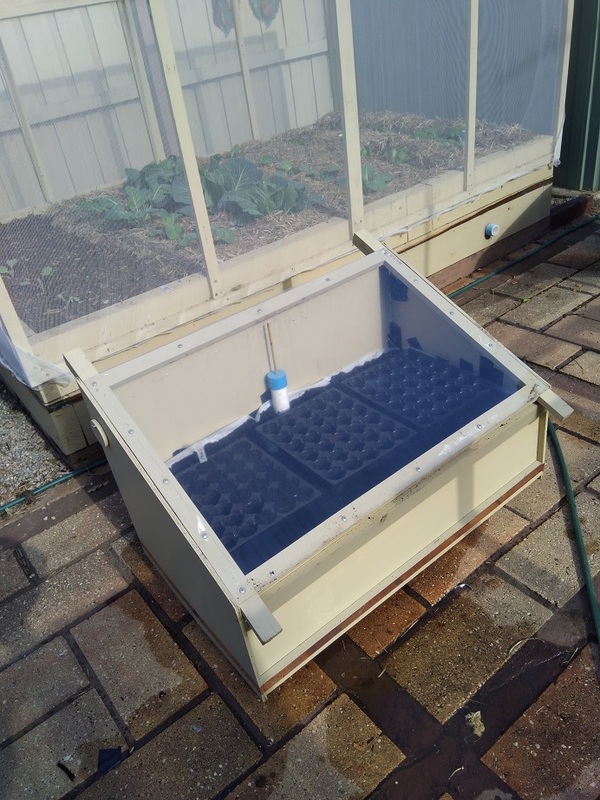 Refurbishment complete, the Ecopropagator is ready in good time for the spring surge in demand for seedlings in my garden.